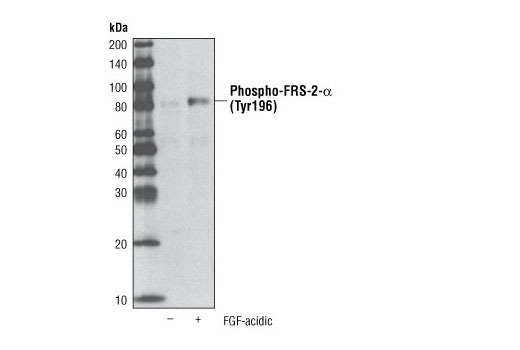 Western blot analysis of NIH/3T3 cell lysates untreated or stimulated with Acidic FGF (50 ng/ml for 10 min) using Phospho-FRS-2-α (Tyr196) Antibody #3864. The human acidic-FGF coding cDNA was obtained from kidney mRNA, subcloned into an expression vector and expressed in E. coli. The recombinant human acidic FGF was purified and stored in PBS buffer containing 0.1% BSA. ED50 for aFGF-stimulated NIH/3T3 cell proliferation assay is 0.1-0.4 ng/ml. CST recommends using 50-100 ng/ml for stimulation of bFGF signaling. Acidic FGF is supplied as a solution. It should be stored at -80ºC. Aliquot the reagent upon receipt and avoid repeated freeze-thaw cycles. CST recommends using 50-100 ng/ml of aFGF for stimulation of aFGF signaling. Store at -80°C. Aliquot the reagent upon receipt and avoid repeated freeze-thaw cycles. Fibroblast growth factors are a family of broad-spectrum growth factors influencing a plethora of cellular activities. The interaction of at least 23 ligands, 4 receptors and multiple coreceptors provides a dramatic complexity to a signaling system capable of effecting a multitude of responses (1,2). Basic fibroblast growth factor (bFGF or FGF2), initially identified as a mitogen with prominent angiogenic properties, is now recognized as a multifunctional growth factor (3). It is clear that bFGF produces its biological effects in target cells by signaling through cell-surface FGF receptors. bFGF binds to all four FGF receptors. Ligand binding induces receptor dimerization and autophosphorylation, allowing binding and activation of cytoplasmic downstream target proteins, including FRS-2, PLC and Crk (4,5). The FGF signaling pathway appears to play a significant role not only in normal cell growth regulation but also in tumor development and progression (6). Acidic FGF (aFGF or FGF1) is another extensively investigated protein of the FGF family. aFGF shares 55% DNA sequence homology with bFGF. These two growth factors are ubiquitously expressed and exhibit a wide spectrum of similiar biological activities with quantitative differences likely due to variation in receptor affinity or binding (7). Bansal, R. (2002) Dev. Neurosci. 24, 35-46. Morrison, R.S. et al. (1994) J. Neurooncol. 18, 207-216. Kouhara, H. et al. (1997) Cell 89, 693-702. Bikfalvi, A. (1995) Eur. J. Cancer 31A, 1101-1104. Ledoux, D. et al. (1992) Prog. Growth Factor Res. 4, 107-120.